Instant noodles is what i been having frequently whenever i m lazy to cook or i have little time to comprehend cooking. Its so convenient and to some local chinese, its their way of life. The idea of adding hot water and to wait for few minutes for the noodles to be cooked can be so compelling and practical. 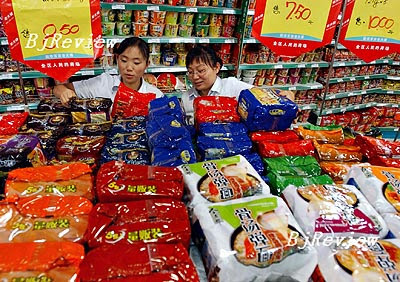 Such compelling and practical factors had led China to become the largest instant noodles market in the world. Its probably the single most important item that most households in China will carry in their kitchen. Dont underestimate that little packed food. It has a market estimated at $6.6 billion and will double to $13 billion in 2012 and all players are scrambling for market share and brand recognition. Its consumers spend around $5 per capita per year on instant noodles, according to Euromonitor International. The packaging is appealing and what makes it more appealing is that its relatively very cheap ranging from RMB 1 - 5 ($0.14 - o.70) per pack. So how can noodle manufacturers get a piece of the action? Product development, advertising and distribution appear to be key, according to players and experts. The core to instant noodles business is brand management. Increasing brand recognition is crucial and total advertising spending promoting instant noodles in China in 2006 alone amounted to $237.4 million, a 19 percent jump from the previous year, according to Nielsen. Despite the size of the market, China's noodle industry is dominated by one company: Taiwan-founded Tingyi. Its Master Kong brand commands a lofty 43.3 percent share. Its closest rival, Japanese joint venture Nissin Hualong, has 14.2 percent, followed by Uni-President with 10.5 percent, according to CIMB-GK. I had tried most of the brands here but my favorite is still the Master Kong's label which explain why they are in such dominant position in China. At the end of the day, while branding can play a huge buying factor, whats more important is how good its when you eat it. All the brandings in the world isnt going to help you sell rotten apples.